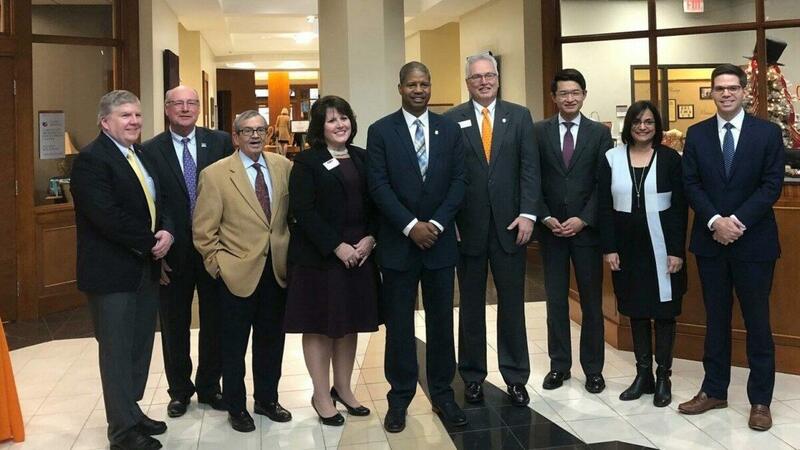 In early January, Campbell’s Lundy-Fetterman School of Business partnered with Business North Carolina to prognosticate about the state’s economy in the coming year. Part of the Business School’s year-long 40th anniversary celebration of its MBA program, the format was an economic round-table of eight distinguished business leaders. Given recent market – and climate – volatility, 2019 seems sure to be an interesting year of highs and lows in the Tar Heel State. The panel was the first in a series of workshops and round-tables to be hosted by the Campbell MBA program in 2019. Designed to engage students, alumni, and the business community in dialogues on timely topics impacting the business climate in North Carolina and beyond, the events will be hosted in Campbell’s downtown Raleigh campus. Home to the Campbell MBA, Masters of Trust & Wealth Management, and Law programs, this accessible venue is a center for discussion, networking, and community gatherings as members of the business community explore and examine relevant issues.